Going to the dentist can be scary for both kids and adults. Great design, however, has the power to transform what may seem like an unnerving experience into a pleasant one. 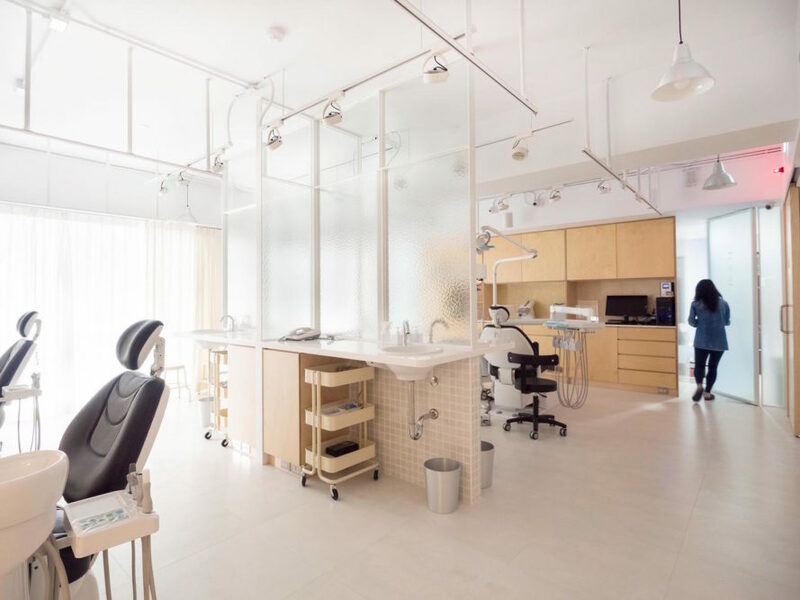 Taipei-based Belgian architect Germain Canon and industrial designer Li Mengshu achieved just that in their design of Luxin, a Taiwanese dental clinic in Taoyuan city created to feel like a welcoming home rather than a sterile office. Like many medical environments, the Luxin dental clinic is dominated by white surfaces that give the interior a hygienic and pristine feel. However, Canon and Mengshu’s design notably departs from the norm with their unusual take on the reception room that looks more like a cozy living room rather than the typical waiting room. Floor cushions, a variety of seating styles, and ample natural light help create a calming home-like environment. To maximize access to natural light, the designers installed glazed sliding doors and frosted partitions that also make the clinic feel more open, spacious, and accessible. “Our aim was to design a clinic we would be less afraid to go to: a space that feels accessible, rather than hermetic,” said Canon. Timber surfaces used in the furnishings and doorways lend a sense of warmth, while small and playful design details, like the colorful zigzag bathroom floor tiles and wooden toothbrush shelving, add unique character. The light-filled treatment room also connects to a small photography studio where patients can take before-and-after treatment photos. Like many medical environments, the LeXin dental clinic is dominated by white surfaces that give the interior a hygienic and pristine feel. However, Canon and Mengshu’s design notably departs from the norm with their unusual take on the reception room that looks more like a cozy living room rather than the typical waiting room. Floor cushions, a variety of seating styles, and ample natural light help create a calming home-like environment. "Our aim was to design a clinic we would be less afraid to go to," said Canon. Timber surfaces used in the furnishings and doorways lend a sense of warmth, while small and playful design details, like the colorful zigzag bathroom floor tiles and wooden toothbrush shelving, add unique character. The light-filled treatment room also connects to a small photography studio where patients can take before-and-after treatment photos.